(4) experience of marginalization, dispossession, and exclusion. The conception of “indigenous people” has a strong sociopolitical connotation and is always shaped by different historical and cultural contexts. Indigenous media can be broadly defined as media and forms of media expression conceived and produced by indigenous people (Ginsburg, 1991; Wilson & Stewart, 2008). By strategically inserting their own narratives in the dominant media and communication landscape, indigenous people also utilize media technologies as means for social change and political transformation. And such media-making practices have become part of the “ongoing struggles for Indigenous recognition and self-determination” and can therefore, and according to Ginsburg (2000: 30), be understood as “cultural activism”. To understand indigenous media practices as a form of cultural activism means to acknowledge indigenous people’s agency to self-consciously talk back to structures of power that neglect their political, sociocultural, and economic needs and interests (e.g., Ginsburg, 1991, 2002; Turner, 1992, 2002). Critics of this activist narrative either contend that the indigenous appropriation of “western” media technologies result in the loss of “traditional” culture, language, and knowledge (e.g., Weiner, 1997) or that this narrative tends to neglect indigenous people’s own articulations of media practices (e.g., Hafsteinsson, 2013). Indigenous media making, moreover, includes the creation of social connections to other indigenous people and to non-indigenous actors alike. Thus, contributing to an alternative cultural project which is “created by Indigenous people about their own lives and cultures” and which is closely related to the mediation of culture and the (re)production and transformation of identities (Ginsburg, 2000: 45). And this is key to cultural survival. By reflecting on contemporary sociocultural and political situations and by recombining elements from both the indigenous and the non-indigenous society, indigenous media challenge essentializing conceptions of identity and culture. Indigenous people(s) have been utilizing digital and networked media technologies since the early 1990s to communicate, represent, connect, network, and cooperate on a local, regional, and global scale (e.g., Dyson, 2011; Dyson et al., 2007; Landzelius, 2006). Particularly in regions where indigenous people had access to the necessary infrastructure, they became “early adopters” of digital technologies.2 Precisely because of their collective experience with marginalization and dispossession, they were among the first to make strategic use of these alternative, globally networked technologies; for instance in the global movement of indigenous peoples and for the construction of a global indigenous identity (e.g., Forte, 2006; Niezen, 2005). One of the first examples of indigenous digital media activism is the Zapatista movement in Mexico (e.g., Belausteguigoitia, 2006; Cleaver, 1998; Pitman 2007). With the support of non-governmental organizations and solidarity networks and their utilization of early forms of online communication, the Zapatistas created a transnational counter-public to circulate their call for indigenous rights. Digital technologies contributed thus to the global popularization of the Zapatistas, the insertion of the indigenous cause into the national civil society, and eventually the survival of a regional sociopolitical movement. Globally distributed digital technologies also support the political endeavors of indigenous groups for the recognition of their collective identity. Carib and Taino communities in the Caribbean and the diaspora, for instance, have been utilizing the Internet to create forums of self-representation and networks of support to strengthen their struggle for cultural revival and indigenous identity reconstruction (Forte, 2006). 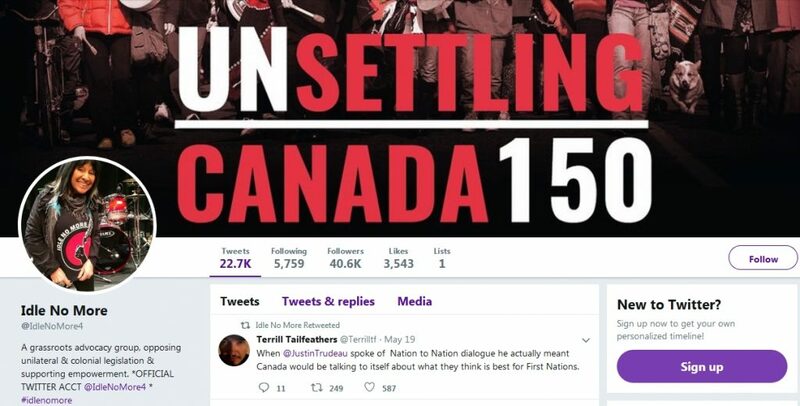 In recent years, social media have become crucial for indigenous people’s sociopolitical struggle and related activist practices, from the Idle No More movement in Canada to the Standing Rock protests in the U.S. (e.g., Dreher et al, 2016; Duarte 2017). Twitter, for example, is heavily utilized to communicate issues and share content related to Native Americans’ political and activist life as a recent study by Duarte and Vigil-Hayes indicate (2017). But the use of Internet technologies and services rely on digital infrastructures. And to connect local, indigenous communities to the Internet and to maintain the necessary infrastructures is challenging for these small, often remote, communities (e.g., Duarte & Vigil-Hayes, 2017; Sandvig, 2012). However, as the case of the Keewaytinook Okimakanak Kuh-ke-nah Network (KO-KNET) in Northwestern Ontario, Canada, indicates, indigenous communities haven been successfully creating and maintaining their own ICT infrastructures and services. Owned and controlled by First Nations, KO-KNET has been facilitating (broadband) Internet connectivity and different Internet-related services for remote indigenous communities in Northwestern Ontario since 1994 (e.g., Beaton et al., 2009; Fiser & Clement, 2012). Living in a remote community in Northwestern Ontario means that there is no year-round road access and that it is distant from other settlements and town service centers. In the context of infrastructure development, this remote region with low population density is considered as “high-cost serving area” (Fiser & Clement, 2012: 256-258). Therefore, the public and the private sectors have been rather reluctant to invest in the First Nation communities. KO-KNET started with a simple bulletin board system that allowed community residents to communicate with family members who had to leave home. Overall aim of this community-driven, sociotechnical development was to give people a choice and the possibility to stay in their home communities. Today, the ICT infrastructure includes landline and satellite broadband Internet as well as Internet-based mobile phone communication, all under the control of the local communities (Beaton et al., 2016). Moreover, KO-KNET established services that have become widely popular beyond the KO communities such as KO Telemedicine, videoconferencing, the Keewaytinook Internet High School, and the online environment MyKnet.org. MyKnet.org was set up around the year 2000 by KO-KNET to enable young First Nations people to create digital presences within a cost- and commercial-free space on the web. In the years to follow, different age groups across Northern Ontario and the neighbouring regions started to use this online environment, which still is a free homepage service exclusively for First Nations people. While MyKnet.org had approximately 25,000 active homepages in 2013, these numbers dropped dramatically since 2014; with about 2,880 homepages in May 2018. This decrease is mainly due to KO-KNET’s decision to switch to WordPress as MyKnet.org’s hosting platform to reduce administration and maintenance costs. A move which required users to set up new websites. Additionally, MyKnet.org has experienced a steady decline of active users over the last six years due to the rise of commercial social networking platforms such as Facebook. Even though MyKnet.org’s best days are over, it used to be extremely popular among First Nations people, particularly between 2004 and 2008. This was mainly because of two reasons. First, MyKnet.org supported people to establish and maintain social connections across spatial distance in an infrastructurally disadvantaged region. They communicated by writing messages in the homepage’s communication boxes and they linked their homepages to the MyKnet.org pages of family members and friends. Secondly, MyKnet.org contributed to different forms of cultural representation and identity construction. Homepage producers utilized the service to present and represent themselves, their families, and their communities by sharing pictures, music, texts, and artwork (Bell et al., 2012; Budka, 2015; Budka et al., 2009). MyKnet.org can be conceptualized as a field of practices that includes and connects several digital practices and their elements on different levels (Reckwitz, 2002; Schatzki, 2001). I understand practices here as embodied activities “that humans perform with varying degrees of regularity, competence and flair” (Postill, 2010: 1). To become part of this social field, people either create homepages and content, interact through homepages, or read the homepages’ content. These broader digital practices consist of various digital activities and are furthermore interconnected with practices like social networking, family bonding, or learning (Budka, 2015). Producing and maintaining homepages, for example, includes activities such as coding, designing, and sharing. Such a practice approach allows for shifting the analytical focus from the use and consumption of digital media technologies to the practices which are integrating these technologies in everyday life, avoiding thus a media or technologycentric understanding of media and technologies (e.g., Christensen & Røpke, 2010). During its heyday, one of the most popular activities in MyKnet.org was listening to music, mainly by sharing “music codes”. These HTML codes were copied and pasted from the source code of one homepage to another. Besides creating this way a huge online music collection, homepage owners also utilized music codes to increase web traffic, which was then measured and publicly displayed via “hit counters”. 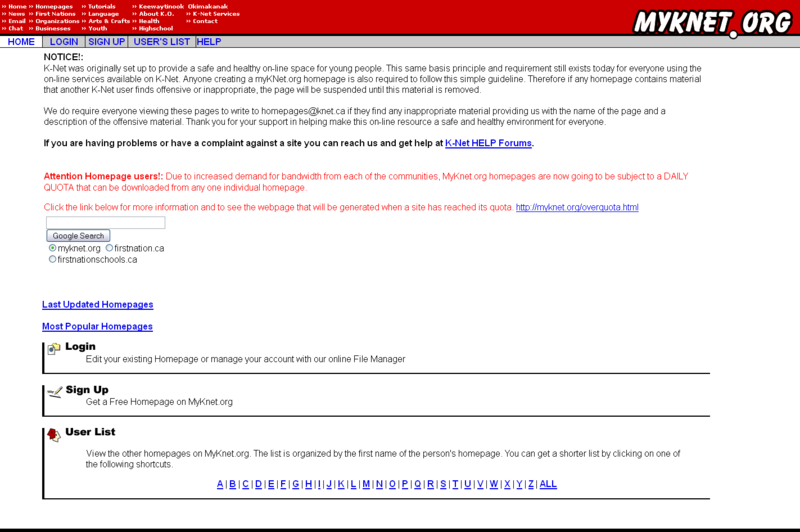 Until 2007, the 100 “most popular homepages” were officially listed in a special section of the MyKnet.org website. And many homepage producers were eagerly trying to get on this list. An increase of homepage hits was thus “rewarded” with an increase of symbolic and cultural capital in this social field (e.g., Bourdieu, 1977; Warde, 2005). Moreover, music became an essential part of the homepages’ audiovisual design and layout. Music related practices in MyKnet.org thus contributed to the formation and negotiation of social status as well as authorship and subsequently to processes of self-articulation, cultural representation, and identity construction. Digital practices in MyKnet.org affected also KO-KNET’s Internet infrastructure and bandwidth policy. Even though most of the network’s bandwidth was allocated to services such as telemedicine, MyKnet.org was actually the biggest bandwidth user. And even though MyKnet.org is not any longer the most popular digital platform for the region’s indigenous people, this locally developed and controlled First Nation service demonstrates how users’ loyalty and a sense of belonging can keep a small, non-commercial digital service alive, despite the increasing dominance of corporate social media. To understand indigenous people’s articulations of their own “digital realities”, the collective and the individual dimension need to be considered. While it remains important to study the sociopolitical activities of indigenous collectivities in relation to digital and social media (e.g., Dreher et al. ; Duarte, 2017), it is also necessary to consider and explore everyday digital practices (e.g. Budka, 2015, 2018; Molyneaux et al., 2014). By drawing on a literature review and by building on ethnographic and historical research on an indigenous digital service owned and controlled by First Nations people, I tried to combine the collective activist dimension with the individual mundane dimension of indigenous engagements with digital media. Thus, promoting an inclusive approach to indigenous articulations in the digital age. Beaton, B., Burnard, T., Linden, A., & O’Donnell, S. (2016). Keewaytinook Mobile: An indigenous community-owned mobile phone service in northern Canada. In L. Dyson, S. Grant & M. Hendriks (Eds. ), Indigenous people and mobile technologies (pp. 109-125). New York: Routledge. Belausteguigoitia, M. (2006). On line, off line and in line: The Zapatista rebellion and the use of technology by Indian women. In K. Landzelius (Ed. ), Native on the net: Indigenous and diasporic peoples in the virtual age (pp. 97-111). London: Routledge. Bell, B., Budka, P., & Fiser, A. (2012). “We were on the outside looking in” – MyKnet.org: A First Nations online social environment in northern Ontario. In A. Clement, M. Gurstein, G. Longford, M. Moll & L. R. Shade (Eds. ), Connecting Canadians: Investigations in community informatics (pp. 237-254). Edmonton: Athabasca University Press. Budka, P. (2018). Indigenous media technologies in “the digital age”: Cultural articulation, digital practices, and sociopolitical concepts. In S. Yu & M. Matsaganis (Eds. ), Ethnic media in the digital age. New York: Routledge. In press. Budka, P. (2015). From marginalization to self-determined participation: Indigenous digital infrastructures and technology appropriation in Northwestern Ontario’s remote communities. Journal des Anthropologues, 142-143, 127-153. Cleaver, H. (1998). The Zapatistas and the electronic fabric of struggle. In J. Holloway & E. Peláez (Eds. ), Zapatista! Reinventing revolution in Mexico (pp. 1-21). London: Pluto Press. Duarte, M. E., Vigil-Hayes, M. (2017). #Indigenous: A technical and decolonial analysis of activist uses of hashtags across social movements. Mediatropes, Vii(1), 166-184. Dyson, L. E.(2011). Indigenous peoples on the Internet. In M. Consalvo & C. Ess (Eds. ), The handbook of Internet studies (pp. 251-269). Oxford: Wiley-Blackwell. Dyson, L. E., Hendriks, M., & Grant, S. (Eds.). (2007). Information technology and indigenous people. Hershey, PA: Idea Group. Fiser, A., & Clement, A. (2012). A historical account of the Kuh-Ke-Nah Network. In A. Clement, M. Gurstein, G. Longford, M. Moll & L. R. Shade (Eds. ), Connecting Canadians: Investigations in community informatics (pp. 255-282). Edmonton: Athabasca University Press. Forte, M. C. (2006). Amerindian@Caribbean: Internet indigeneity in the electronic generation of Carib and Taino identities. In K. Landzelius (Ed. ), Native on the net: Indigenous and diasporic peoples in the virtual age (pp. 132-151). London: Routledge. Ginsburg, F. (2000). Resources of hope: Learning from the local in a transnational era. In C. Smith & G. K. Ward (Eds. ), Indigenous cultures in an interconnected world (pp. 27-47). Vancouver: UBC Press. Ginsburg, F. (2002). Mediating cultures: Indigenous media, ethnographic film, and the production of identity. In K. Askew & R. Wilk (Eds. ), The anthropology of media: A reader (pp. 210-235). Malden, Blackwell. Hafsteinsson, S. B. (2013). Unmasking deep democracy: An anthropology of indigenous media in Canada. Aarhus: Intervention Press. Landzelius, K. (Ed.). (2006). Native on the net: Indigenous and diasporic peoples in the virtual age. London: Routledge. Pitman, T. (2007). Latin American cyberprotest: Before and after the Zapatistas. In C. Taylor & T. Pitman (Eds. ), Latin American cyberculture and cyberliterature (pp. 86-110). Liverpool: Liverpool University Press. Postill, J. (2010). Introduction: Theorising media and practice. In B. Bräuchler & J. Postill (Eds. ), Theorising media and practice (pp. 1-32). New York: Berghahn. Sandvig, C. (2012). Connection at Ewiiaapaayp Mountain: indigenous internet infrastructure. In L. Nakamura & P. A. Chow-White (Eds. ), Race after the Internet (pp. 168-200). New York & London: Routledge. Schatzki, T. (2001). Introduction: Practice theory. In T. Schatzki, K. Knorr Cetina & E. von Savigny (Eds. ), The practice turn in contemporary theory (pp. 1-14). London: Routledge. Turner, T. (2002). Representation, politics, and cultural imagination in indigenous video: General points and Kayapo examples. In F. Ginsburg, L. Abu-Lughod, & B. Larkin (Eds. ), Media worlds: Anthropology on new terrain (pp. 75-89). Berkeley: University of California Press. Wilson, P., & Stewart, M. (2008). Indigeneity and indigenous media on the global stage. In P. Wilson & M. Stewart (Eds. ), Global indigenous media: Cultures, poetics, and politics (pp. 1-35). Durham: Duke University Press. There are about 370 million indigenous people, living in more than 90 countries, and speaking more than 4,000 of the world’s estimated 7,000 languages (Secretariat of the United Nations Permanent Forum on Indigenous Issues, 2009). The Oneida Indian Nation of the State of New York was the first native group worldwide to put an indigenous owned website online in spring 1994 (Polly, 1997).